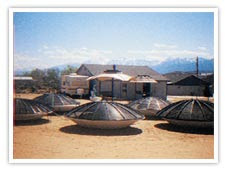 Gardening in high desert country is a challenge, but using satellite dishes to make planters proved to be a good idea. We drill six holes into the bottom of each for drainage before planting. This idea and photo was submitted to Backyard Living Magazine by Bonnie Redfearn, Carson City, Nevada. Visit Backyard Living Magazine.com to subscribe to their free newsletter. New York City’s public libraries are increasingly serving as makeshift employment centers. At the 58th Street branch in Manhattan, out-of-work professionals crowd the computers in the afternoon, a time that had previously been dominated by elderly patrons, and books on résumé writing are hard to keep on the shelves. The Science, Industry and Business Library on 34th Street drew 700 people to a career preparedness fair in January, and the Bronx Library Center recently doubled the number of computer classes it offers to the elderly because people looking to re-enter the work force had packed the existing classes to overflow levels. The new role comes amid a broader surge in demand for libraries’ free goods and services that is typical during economic downturns. In the fourth quarter of 2008, circulation rose 16 percent compared with the previous year at the New York Public Library, which serves Manhattan, the Bronx and Staten Island; 9 percent at the Brooklyn Public Library; and 2 percent in Queens. All three systems also report significant increases in the number of visits. Read the entire article. An adult version of the childhood favorite, with unusual spices for added flavor. In a small bowl, soften tapioca in warm water for 1 hour. Drain and discard water; transfer tapioca to saucepan. Dissolve cornstarch in 1 cup milk, then add to tapioca. Add remaining milk, coconut milk, ginger, honey, cinnamon, curry powder, and pepper. Cook over low heat, stirring gently, until tapioca pearls are clear, about 20 minutes. Slice banana. Remove coconut mixture from heat and add banana. Pour into individual ramekins and chill. Get more delicious recipes at Delicious Living Magazine. Don't waste money and packaging on shampoo. You can make shampoo yourself. Planet Green gives you three (3) shampoo recipes. Given the current economic climate, it goes without saying that many people are having to make very difficult decisions, cutting back on spending and going without anything not strictly essential. For some, that means some hard choices about charitable donations: if you're a regular or occasional contributor to good causes, you might be seriously curtailing your gifts. This can have a negative effect on you. However, if you value being able to help others and contribute, you may feel upset or even guilty that you're no longer in a position to do so. Or perhaps you've rarely or never given to charity in the past, but you've been moved by the suffering caused by the financial crisis - yet you yourself have little money to give. The good news is that there are a number of ways you can make a real difference, without much money. Here are three ways that you could put into practice today, whatever your financial circumstances. Why not give one a try? You might not be able to contribute $20/month to a good cause, but how about $5 or $2? Foregoing a Starbucks latte once a month could give you enough for this. Here in the UK, the recent Comic Relief fundraising (with thousands of events around the country, and a televised all-evening event in March) raised £57 million by the end of the televised event - that's a record-breaking figure, and an enormous amount of money for people in desperate need. However, with a UK population of 60.9 million, it's less than one pound (approx $1.45 at current exchange rates) for every person in the UK. Believe it or not, most effective complaint letters or e-mails don't sound like complaint messages. They simply state the problem calmly and confidently and anticipate that the company will comply with the request they make. Most companies want your business and will often even absorb a loss to maintain good will. You will probably be frustrated and angry when, for example, a product doesn't work the way it should. It's only natural to want to take out your frustration on the manufacturer. But doing so could make matters worse. Would you want to read an emotionally charged letter full of insults? As one of my students said the other day, "I wouldn't want to deal with a person who attacks me in a letter. I'd get defensive and put the letter at the bottom of my to-do list." Time management advice often talks about the important of having a schedule. When you're at work, the plethora of meetings, conference calls and to-do lists probably provide a lot of structure. Whether you are actually getting things done is another story. But have you ever given any thought to scheduling your leisure time? Many of us find it all too easy to let our evenings and weekends fall into a comfortable – and often rather boring or unsatisfactory – routine. To get the most out of both your work and your play, try some of these ways of giving your leisure time a little structure too. * Scheduling Leisure Time During Your Day If you're a student or freelancer, you probably have a fair degree of flexibility about when you do your work. You may also find that there are times when you try to micro-schedule your work, but you still end up procrastinating, working much more slowly than you know you should, and rushing things at the last minute. In a steadily shrinking economy, unemployment benefits are critical for workers receiving pink slips. But some banks view such benefits as an- other potential revenue stream and are charging thousands of jobless people fees to access their unemployment money. • Laid-off engineer Arthur Santa-Maria, 57, of Belen, N.M., found that out when he called Bank of America with a question about the debit card that held his more than $300-a-week unemployment benefits. He was charged 50 cents for a query about his balance, and $1.50 for making two withdrawals in one day. • Bank of America says its fee schedule is consistent with what other banks charge for such cards. But Santa-Maria, who tried unsuccessfully to get direct-deposit payments, says those fees hurt when "I'm scrambling just to make ends meet." • New Mexico is one of 30 states using banks and credit card companies to disburse unemployment benefits via debit cards, along with direct deposit. Officials say debit cards help reduce costs of postage, paper and processing; the savings for New Mexico are reportedly up to $1.5 million a year. • "These types of programs are designed to save the states money and provide recipients added convenience without added expense,"says Nina Das, spokeswoman for Citi, which facilitates benefits on prepaid cards in Kansas and Maryland. • But Santa-Maria is still caught in the middle. "Now they're charging me money to get to my unemployment money," he says. "That's wrong." Auto mechanics are consistently ranked high on consumer complaint lists, so it can be hard to find out if you're being scammed for repairs when you ask for a quote. Now there's help online! The Repair Pal website offers free, realistic quotes based on surveys of auto repair prices at thousands of shops across the country. The website lists local mechanics and provides quotes for repairs and maintenance in your zip code and for your specific car model. There's 23 billion different price estimates in all. Register for a free account and you can store your car's repair records and get email reminders for service, and also safety and recall alerts. Visit Repair Pal. Operation Toasty Toes was originaly the making of handmade knitted and crocheted slippers. Now it includes dickeys, headbands, helmets (a.k.a. ski masks), watch caps and wristlets (a.k.a. fingerless mitts). These items are mailed to our Armed Forces stationed overseas. It is a grass roots way to assist in America's fight against terrorism. Besides warming the service person's feet, they send a message of support. That a stranger would take the time to make something shows that we do care. If this is one of your many talents, read more and get details. The economy may be anemic, but it’s not due to a lack of iron … or actually, ironing. But getting that crisp, dry cleaned look may seem daunting to many of us. While mom made it look easy, whipping out a perfectly pressed shirt with beautiful creases in under a few minutes, the fact is it’s not something that comes as instinctive as we might like. There are rules about temperature settings, tips on techniques and other directions, and knowing all of them could be the difference between looking sharp and having the charred silhouette of an iron on the back of your shirt. Collar. Start out with the underside of the collar, gently pulling and stretching the fabric, working from each point to the center. Yoke. (The area of the shirt that rests on your shoulders.) Place one shoulder over the narrow end of the board, ironing from the center out. Repeat on the other shoulder. Cuffs. Iron the inside of the cuffs first then the outside. Sleeves. Iron one sleeve at a time, ironing the outside, or the cuff-opening side, of the sleeves first, and then the inside. Repeat on the other side. Body. Begin by ironing the front panels; be careful and iron around the buttons, not over them. Complete by ironing the back panel. Give the collar another once over, check for any creases and wrinkles you may have missed. If you’re shopping for your first iron or a new iron, there are many to choose from. Ms. Byrne advises to find one that fits well in your hand. Some new designs feature handles and controls that are actually optimized for better comfort. There are also many new features on the market like larger, easier to read temperature dials, simplified temperature controls, spray triggers and reservoir floats making it easier to see the water level. “We’re pleased to welcome a whole new generation of ironers who I think will find that ironing yourself is a great way to save money each week,” Ms. Byrne says. Q. My son has mangled our VCR by getting taffy in it. I reserved a book from the library on VCR repair but won't have it for a few weeks. I thought I could just clean it out but can you use water? Can you scrub some of those "gadgets" without damaging them? If anyone knows how to repair things like this, please, give me your advise. A. My husband is an electronic technician and he says first UNPLUG the machine, then use a q-tip and dab rubbing alcohol on the parts that need cleaning and then let the machine thoroughly dry (minimum of 1 hr.) before plugging back in. Do NOT use water! • In response to the taffy in the VCR ... have her log on to www.repairnow.com. It is a website where you can go to find out how to repair different items from small appliances to refrigerators or air compressors. It helps the average person walk themselves through repairing the product themselves. If all else fails there is ask the expert. Hope that helps. Debbie J.
June marks the entrance to summer in my mind. School is out, children are playing everywhere and flowers are brightly bobbing their heads towards the sun. My favorite part of summer is when the sun is setting and you can open the doors and windows back up for the night. When I was growing up in the 50's we used to sit outside after dinner and talk to people who walked by, or just talk between ourselves. It was family time. I guess now it would be called "quality time." Our only son is grown and lives half way across the country from us, so it's just Randal and I out on our porch, but we're in a community of many walkers, so the evenings we spend outside usually offer a nice visit with somebody. If we have important things to discuss, we sit on the back porch and enjoy the woods. I love forests! There is no place that heals my soul quicker than to be in the middle of the woods. Living near the Blue Ridge Mountains, the views tell me that the world isn't as crowded as it seems. Looking at the immenseness of Creation allows me to realize that my troubles are truly small. Used extensively in Indian cooking, anti-inflammatory turmeric and ginger enhance cruciferous cauliflower, vitamin-rich tomatoes, and high-fiber chickpeas, packing this dish with cancer-fighting potential. Prep tip: Use more or less jalapeño depending on your heat preference. 1. Combine ginger and lemon juice in a small cup. Set aside. 2. Heat a large saucepan over medium-high heat. Add oil, then onion. Cook, stirring occasionally, until onion begins to brown, about 4 minutes. Add jalapeño and continue cooking until onion is brown all over, another 4–5 minutes. Add tomatoes, cumin, coriander, turmeric, cardamom, cloves, and salt. Stir and cook for 1 minute. Add chickpeas and 1/2 cup water. Cover and cook over medium heat for 10 minutes, stirring occasionally and adding more water if mixture becomes dry. 3. Add cauliflower and 1/4 cup water. Cover and cook over medium heat, stirring carefully with a rubber spatula every minute or so, until cauliflower is tender, about 7 minutes. Uncover, increase heat to medium-high, and cook, stirring, to boil off any excess liquid. Stir in lemon juice mixture. Stir in cilantro and serve. Source: Food Recipes from Delicious Living Magazine. Dawn, at Frugal For Life has gone over some ways you and I may be wasting our money. You may find an idea that tightens the leaking hole in your finances. There are 13 great ideas. I like this calculator because it is simple but there are other debt reduction calculators that are out there - just Google them. AARP asked how you pinch pennies these days, and readers responded with a thousand suggestions. The pick of the lot could save you thousands of dollars. One suggestion was to use Google Product Search which lets you sort the results from low price to high. Read the entire article. About U is a collection of free online courses from About.com. Each online course is sent to you via email on a daily or weekly basis and is designed to help you learn a specific skill or solve a particular problem. There are no grades or degrees, only a whole lot of free online learning. Check out the options. In a soup pot on medium heat, warm the oil and cook the onions and garlic for seven minutes, stirring frequently. To your water or stock, add the potatoes, carrots, parsnips, turnips or rutabaga, beets, salt, bay leaves, thyme and/or dill. Cover and bring to a boil. Reduce heat and simmer for 15 minutes. Add the vinegar and chopped greens and simmer for ten minutes more. Salt and pepper to taste, then discard the bay leaves. Serve with a dollop of sour cream or yogurt. Rent-A-Toy is a new company that helps parents cut cost and clutter by renting out toys. From anywhere in the US, you can hop on Rent-A-Toy's website and pick out what toys you'd most like your kiddo to have for awhile. The toys are sanitized and tested to ensure they aren't broken, so there are relatively few safety concerns beyond what a parent would have when buying a new toy. When your child has outgrown or is bored with the toy, you send it on back to the company and rent out something else. The whole program is pretty darn eco-friendly in philosophy, but if you really want to get green about it, you can choose from their selection of environmentally friendly toys. The pricing is pretty reasonable, with plans starting at $25 a month, delivery is free, and pre-paid return labels are included with the shipment. While it might be cheaper to head down to the local thrift store or network with other parents to accomplish the same toy recycling, this program is still a neat way to use toys already in the life stream and have an excuse to get rid of old toys - after all, they have to be returned at some point. It also shows us another way in which recessions are good for greening us up. Energy-efficient washers can use up to 50 percent less energy and 60 percent less water than standard machines. If you have a top loader, regardless of how old it is, consider replacing it with an energy-efficient front loader. These machines are 37 percent more energy-efficient and use 18 to 25 gallons per load, about half what traditional washers use. The percentages on our Product Comparison chart represent how much more energy-efficient an appliance is than federal standards require. Part of the Energy Star rating, the Water Factor is a ratio of how much water is used compared to the size of the drum. For example, a machine with a 4-cubic-foot drum that uses 24 gallons per load has a water factor of 6. The figure is more accurate than gallons per load, since washers vary so much in size. The lower the number, the better. Energy Star-rated machines have water factors ranging from 3.2 to 7.9. Front-loading machines are, in general, more efficient than their top-loading counterparts, using 40 to 60 percent less water and 30 to 50 percent less energy. They also have the benefit of faster spin times, which means your clothes dry faster. Some local utilities offer rebates for purchasing front loaders. Get buying tips and best rated models. You've heard of "you break it, you buy it," but what about "you touch it, you buy it?" Previous studies have shown that many people begin to feel ownership of an item — that it "is theirs" — before they even buy it. But this study, conducted by researchers at Ohio State University, is the first to show "mine, mine, mine" feelings can begin in as little as 30 seconds after first touching an object. Read the entire article. When I was a little girl, my mother taught me how to make Chinese dumplings, or gyoza. These are a light, fresh Japanese version. You can find gyoza wrappers in many supermarkets or Asian grocery stores. 1. To make dipping sauce, combine soy sauce, vinegar, and hot pepper oil in a small bowl or jar. Set aside until serving time. 2. Place cabbage, mushrooms, chives, and scallions in a large bowl. Season with several generous pinches of salt and grinds of pepper. Use your hands to blend ingredients together. 3. Fill a small bowl with cold water. Place 2 teaspoons cabbage mixture in the center of a gyoza wrapper. Lightly wet one finger in the water and trace around the inside of the gyoza wrapper; this makes it sticky enough to seal. Fold wrapper in half; gently press edges from right to left, pinching and folding every 1/4 inch to make a zigzag pattern. Repeat with remaining cabbage mixture and wrappers. Place completed dumplings crimped side up on a foil-lined baking sheet. 4. Heat a large, deep skillet with a lid over high heat and add 1 tablespoon of oil. When hot, reduce heat to medium-low and add 10 dumplings, crimped side up. Cook, uncovered, until lightly browned on the bottom, about 4 minutes. (Do not turn them over.) Pour 1 cup boiling water into the skillet. Cover and steam-cook dumplings over medium heat for 8–10 minutes, until tops are translucent and water is mostly evaporated. Transfer to a plate and keep hot. Repeat process with remaining dumplings, oil, and water. 5. Serve dumplings immediately, golden sides up. Set out small dishes filled with dipping sauce. Get more recipes at DeliciousLivingMag.com. As the US population ages, more and more of us are caring for elderly parents. How can we make sure that their money is protected and that they'll have enough to pay for care, even if one of them dies? Carmen Wong Ulrich offers some advice for planning for your elderly parents' financial future. View video. For small toymakers and manufacturers of children's products, however, the costs of mandatory testing will likely drive them out of business. * A toymaker, for example, who makes wooden cars in his garage in Maine to supplement his income cannot afford the $300 - $4,000 fee per toy that testing labs are charging to assure compliance with the CPSIA. * A work at home mom in Minnesota who makes cloth diapers to sell online must choose either to violate the law or cease operations. * A small toy retailer in Vermont who imports wooden toys from Europe, which has long had stringent toy safety standards, must now pay for testing on every toy they import. * And even the handful of larger toy makers who still employ workers in the United States face increased costs to comply with the CPSIA, even though American-made toys had nothing to do with the toy safety problems of 2007. Read about What You Can Do to stop this. Your refrigerator is probably the most power-hungry appliance in your house, and you'll save money and energy by replacing any model made before 2001. Even post-2001 models may not be as efficient as a new model; use Energy Star’s refrigerator calculator to compare how much energy your fridge uses with the energy used by Green Guide's Product Picks. Energy Star: The most efficient machines are Energy Star rated and use at least 20 percent less energy than federal standards. Top-freezer models: These are the most energy-efficient and repair-free of the configurations offered, followed by bottom-freezer models. Side-by-side refrigerator/freezers are often more convenient, but they're more likely to need repair and can use roughly 7 to 13 percent more energy than top-freezer models. Automatic icemakers increase energy use by 14 to 20 percent. Capacity: Buy a refrigerator that will accommodate everything, rather than buying a new one while keeping your old fridge to store overflow. A typical 1990 model refrigerator costs about $75 per year to run, and releases over 1,200 pounds of CO2 each year; it's much more economical and eco-minded to store all your food in a single refrigerator. Read entire article for more tips. Congress was contemplating how to include the continuation of energy efficiency tax credits in the “economic bailout.” Well, they did it, and even managed to increase some of the incentives. Businesses can even get in on the deal. Get a brief run-down of the credits available in 2009. Baking and find yourself an egg short? Grab that jug of vinegar from the pantry! Replace one egg with a tablespoon of white vinegar. Note: This substitute will work as long as there's another leavening agent (baking powder, self-rising flour or yeast) in the recipe. Feel guilty about not cutting your lawn? You shouldn't! What would happen if you let the lawn go? One couple did that 26 years ago and they've got an incredible habitat that developed over the years. This year due to illness they weren't even able to mow right around the little farmhouse. View a photo essay about what showed up at Hilton Pond while the mower was parked.